The health and wellness hotel Sonnen is surrounded by lush forests and pastures and it is advantageously located in Bad Kohlgrub. The rooms are furnished in a way that is typical for the region, which nicely complements the pleasant atmosphere and the modern comfort of our house. 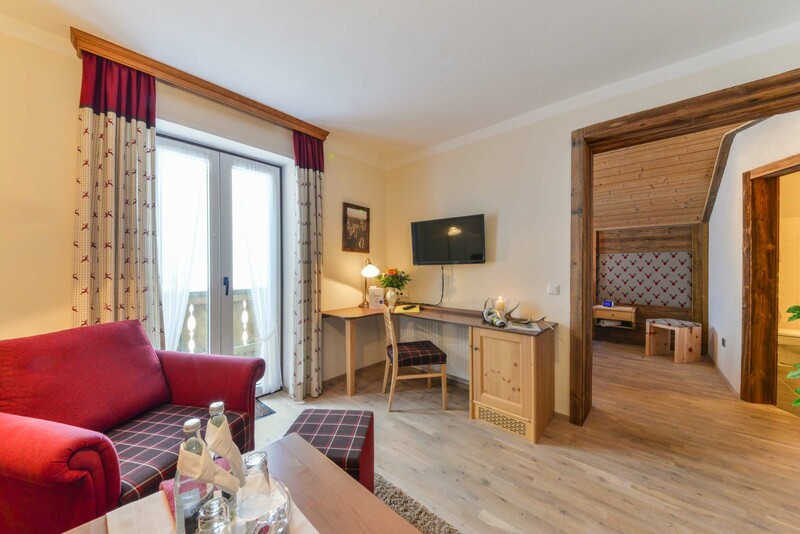 The elevated position of Sonnen, the part of Bad Kohlgrub that lends its name to the hotel, provides lots of light and a wonderful view of the surrounding mountains from our sun terrace or the private balcony of your room or holiday apartment. An eye for detail and the good work of the obliging hotel staff complete the comfortable atmosphere. We offer wellness treatments in our very own sauna and wellness area for a perfect stay. 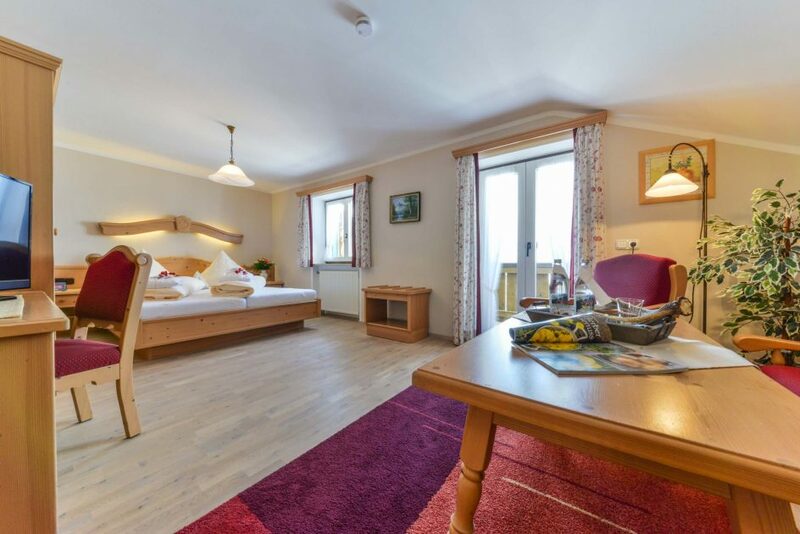 It is only a 5-minute walk to the chair lift up the Hörnle and a 15-minute walk to the center of the beautiful health resort Bad Kohlgrub and its idyllic park. Life in the quaint village of Bad Kohlgrub moves with the seasons. In the summer, locals and guests alike enjoy the sunshine and the beauty of nature by hiking or taking a walk in the marvelous mountains. The healthy mountain air of Bad Kohlgrub, which is located 900 meters above sea level, lets you breath deeply and freely. The winter also invites our guests to do outdoor sports. 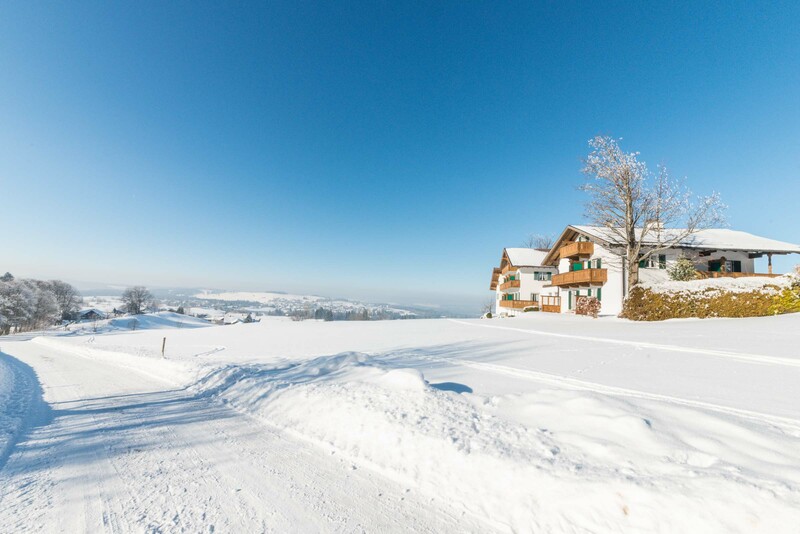 Skiing, cross-country skiing and winter hikes let you explore the romantic winter landscape. In the evening, you can warm up together in our cozy hotel. 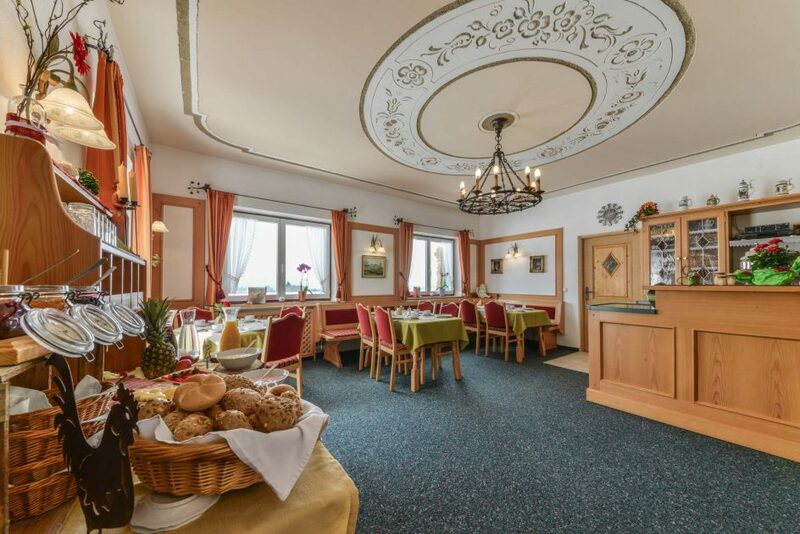 A good breakfast gives our guests the energy for their activities in Bad Kohlgrub and the Ammergau Alps. The rustic hotel restaurant welcomes you with cozy furniture, a lot of light, and friendly decoration. This is where we serve our breakfast buffet every day. 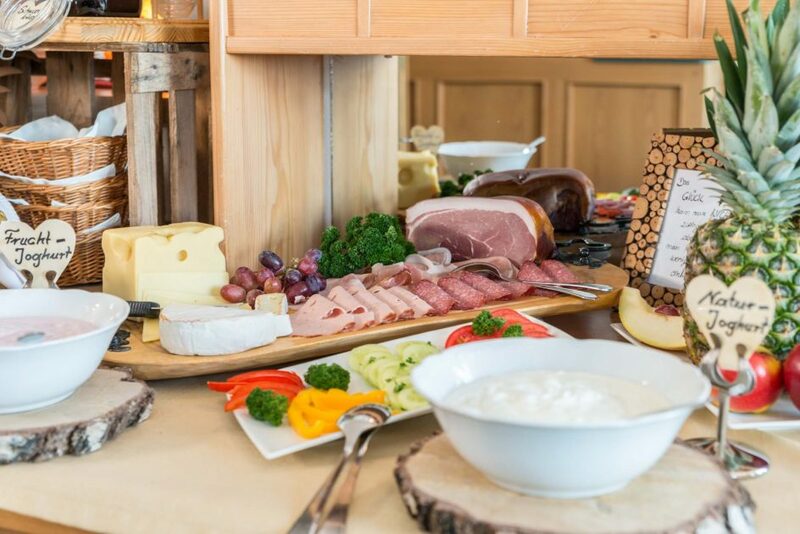 It includes fresh bread and rolls, delicious locally-produced cold cuts and cheese, and vitamin-rich fruits. We serve hot coffee, tea, and juices to make sure that your day starts out the best way possible. In the evening, you can order typical specialties from the region if you wish. 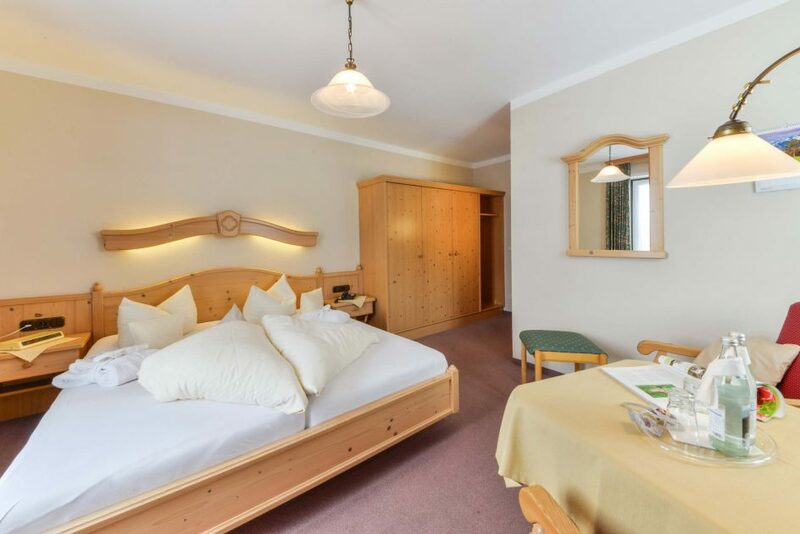 The rooms at the Hotel Sonnen are comfortably furnished and offer a smart mix of modern living atmosphere and attractive traditional elements. We see to it that our rooms are always clean and that all objects in the rooms are in a perfect state. This makes sure that our guests can fully enjoy their stay at our hotel and fully relax during their holiday. In addition, all rooms have a balcony with a lovely view of the mountain panorama. 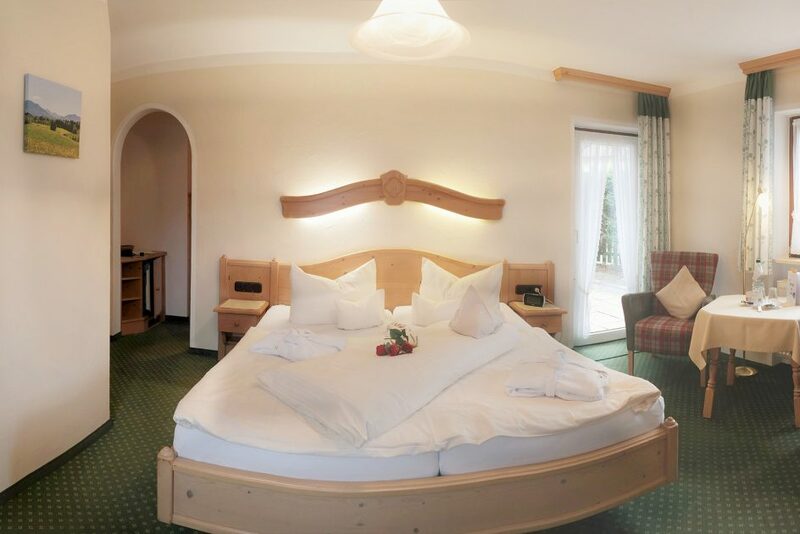 The hotel’s large and inviting suite is on the upper floor of the hotel. It has a separate living room with a large window and direct access to the balcony. The suite is especially spacious and includes a XXL double bed, comfortable furniture, and a wonderful view from the highest point of the house. It is sure to become one of the highlights of your next holiday. If you want to be very independent and are looking for something special, our holiday apartment is the way to go. Enjoy the full comfort of our hotel combined with even more privacy and homely atmosphere. Conveniently prepare your own food in the built-in kitchen and relax in the comfortable, inviting living room.